Today we are having a KINETIC SAND THROWDOWN! Let’s get started! Thanks to Spin Master for challenging us and sponsoring us today! You’ve probably noticed that our family likes to host little game events at home like when we had Cupcake Wars in our kitchen. 🙂 Today, we are changing things up! We have a new throwdown that I think you’re going to enjoy. Thanks to Spin Master for sponsoring this post, so we could participate in this fun experiment. While I was thinking about science experiments for our kids to do at home, I decided that it would be fun to experiment. I thought it would be fun for our kids to compare different types of manipulative sands, slimes, and putty. Our kids LOVE the beach and they love digging in the sand, so I wanted to bring some of that fun into our house. I stopped by the store and picked up a few different containers of these molding toys. When the kids came home from school, I had everything ready on the back porch, ready to be explored. 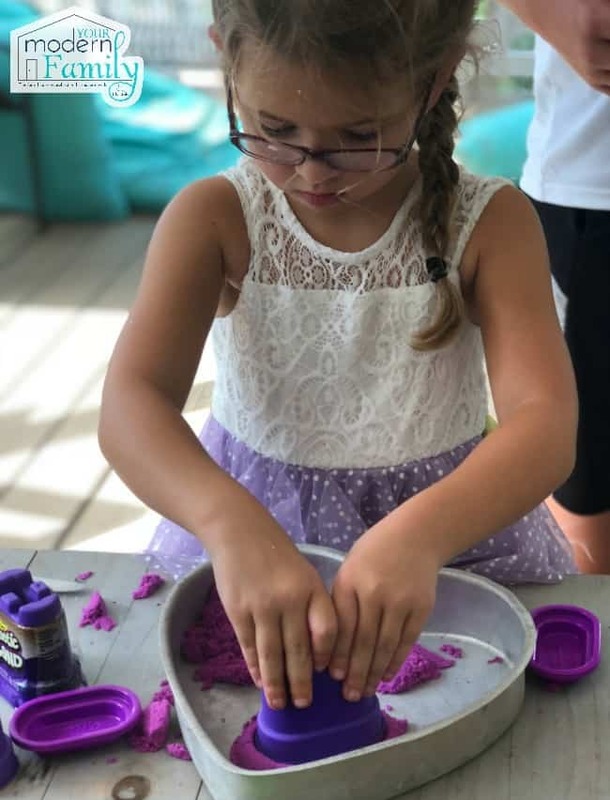 I had putty, slime, Play-doh and Kinetic Sand. 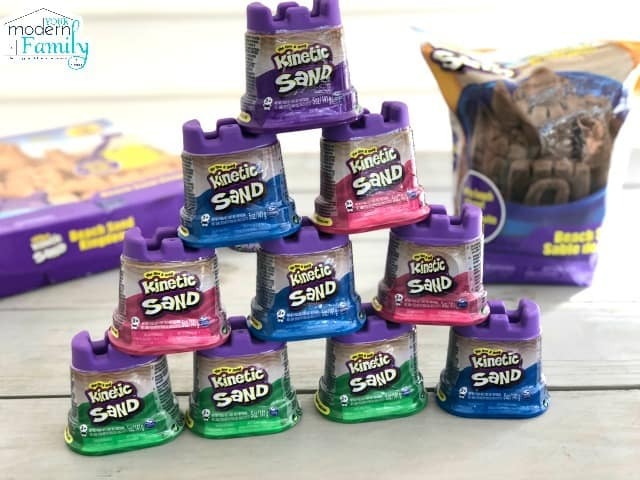 First, in case you haven’t heard of Kinetic Sand, I want to be sure that you know just what it is…other than just MAGICAL. 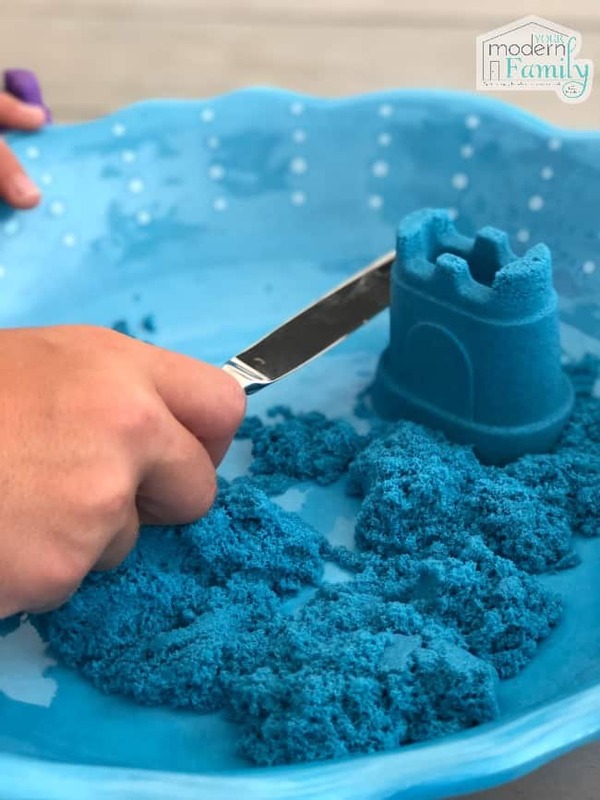 Kinetic Sand is 98% sand and 2% magic! It’s so easy to shape and mold, not to mention it sticks to itself and not to my kids. The specific modeling manipulative toys that we compared were Kinetic Sand (of course), Play-Doh, Nickelodeon Slime, and Putty. We put them all to the test and we all voted on one clear winner. Below I will give you the pros & cons of each one, along with an overall rating. 1 is the worst and 10 is the best. I was extra excited to do this with the kids because I love when playing and learning are aligned, as I think it always should be. This throwdown seemed to be a great way to compare & contrast these materials with our children and help them learn while they play. As a mom, play therapist, and teacher, I cannot stress the importance of play enough. It is highly beneficial and I encourage our kids to play daily. I also encourage them to create. I’ve never been one to shy away from crafting, creating, building, or exploring. 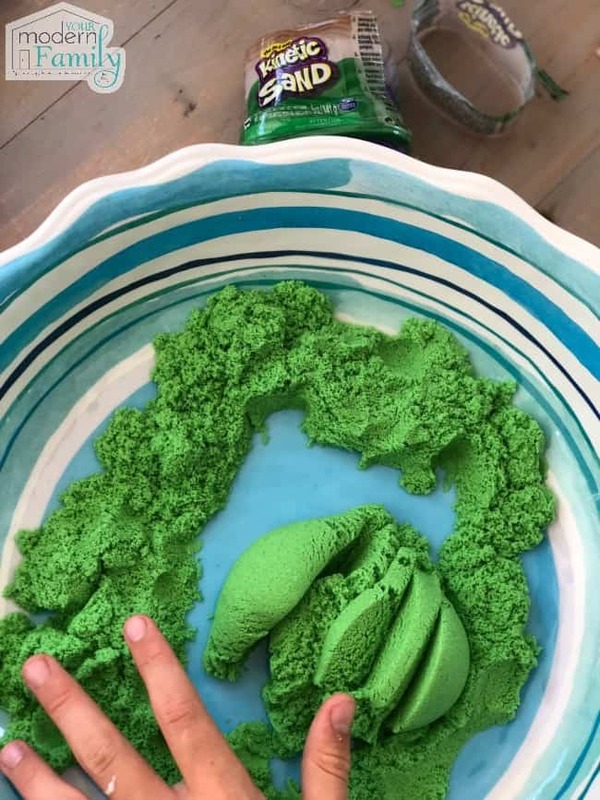 I feel like Kinetic Sand is great for stimulating children’s creative skills. 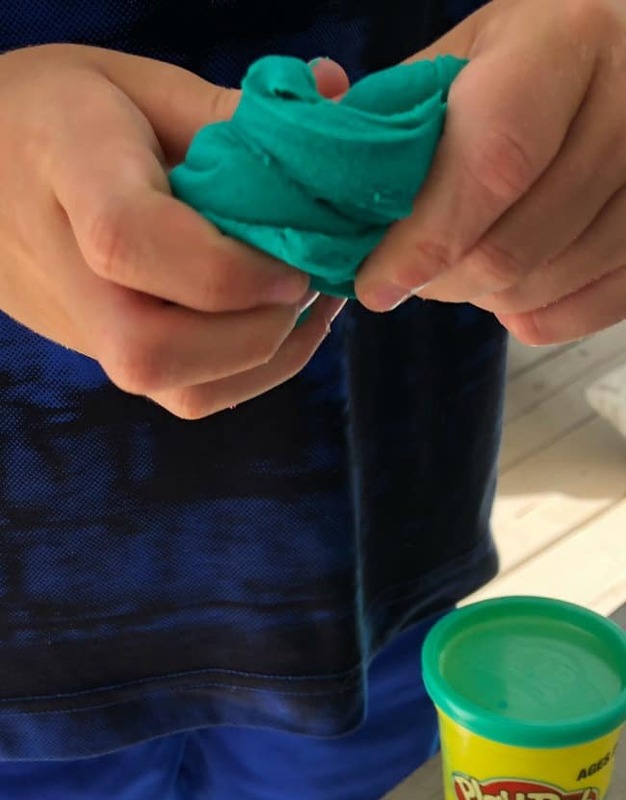 To start off our throwdown the kids tried out slime. We were ALL in agreement: This was a clear loser. It was messy, sticky, and stuck to everything. It stuck to our clothes like glue, stuck to our hands, to the table, and it even stuck to my floor when I was trying to throw it away. 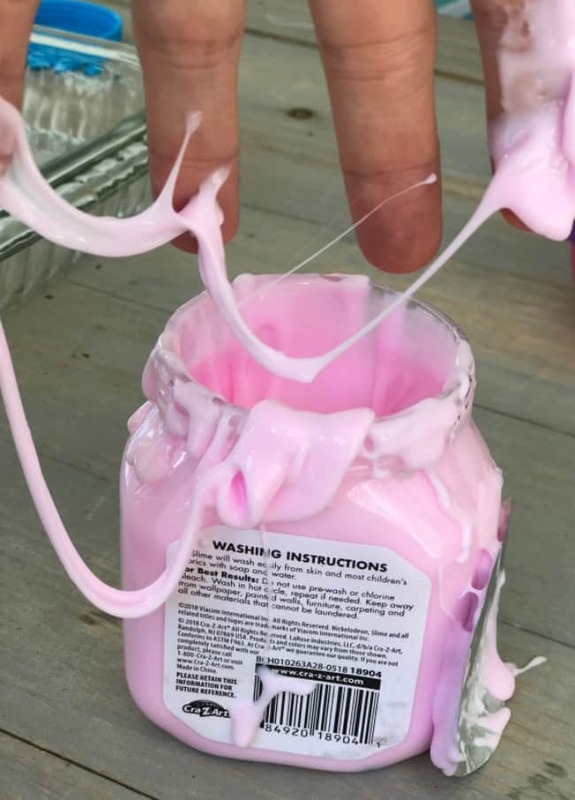 It was literally like melted gum! Cons: Messy. Sticky. Kids didn’t want to play with it. Does not hold shape. Leaks everywhere. A nightmare to clean. After we cleaned that up, we moved onto number two. Pros: Not too messy if you don’t stretch it. Could be used as a stress ball (hard to manipulate). Cons: Very tough. Not easily molded. Can’t build with it. Messy and sticky when stretched. Overall Rating: 3. It didn’t hold the kids’ attention very long. They were bored and asking to move onto the next one. For me, it was messy because they had stretched it. I had a hard time cleaning it up. Next up, we had Play-Doh. 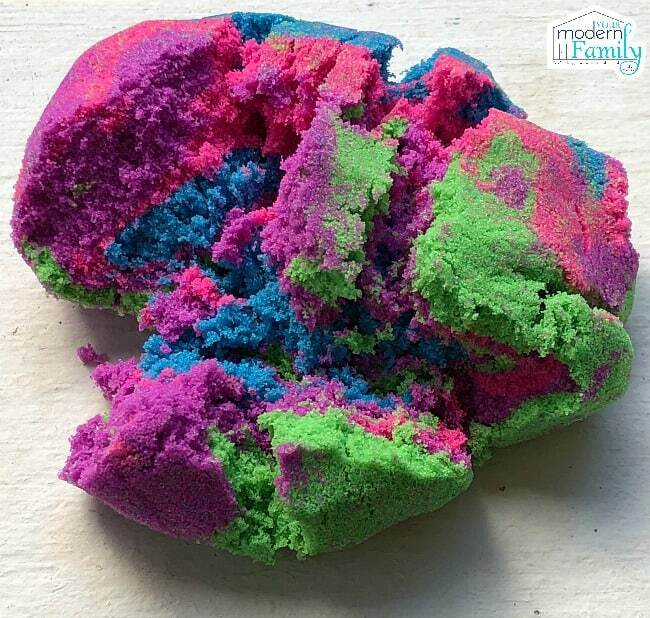 Our kids have always loved to use Play-Doh. They played with this one for about 10 minutes before asking to move on. Pros: Easily moldable. Colorful. Doesn’t stick to hands too much. Cons: Sticks to carpeting (we have area rugs under our tables and if you don’t pick it up immediately, it is impossible to get out. I’ve had to cut spots of the rug out to remove the stains). They each picked a different color and began playing. 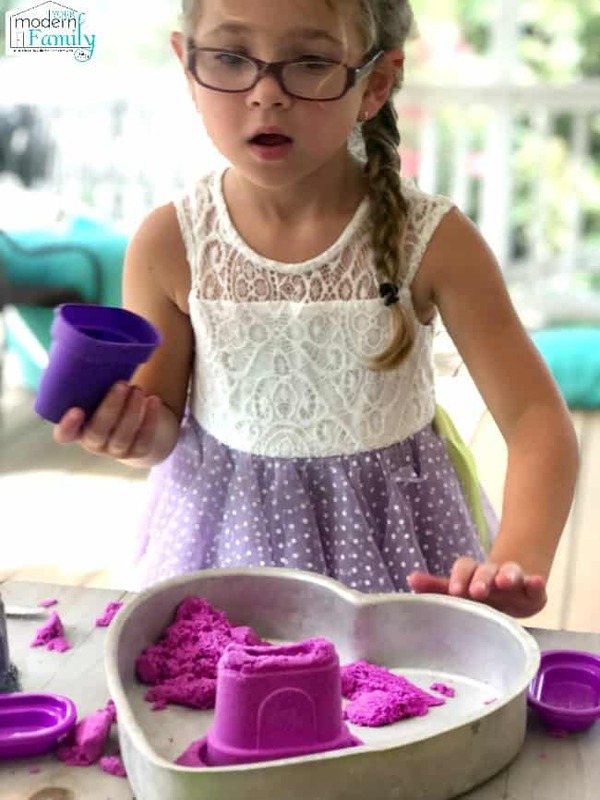 I personally loved playing with Kinetic Sand, too. It’s great because when you spread your fingers apart, it just flows through your fingers. The kids loved that part too! They were stretching it, smashing it, rolling it into a ball, and molding it into a million different shapes. They created so many different ways to play building castles, rolling it into cylinders and cutting it. The found an endless number of ways to play! Of course, they each wanted to cut it with a child’s butter knife… and they did this several times. Kinetic Sand held their attention for over an hour! We even had to tell them that they had to clean up because we had to run to the store. The clean-up time was minimal because it really is mess-free, and just like it claims because it sticks to itself. As a parent, I love that the sand sticks to itself, but unlike other products, it does not stick to you, your child, the table, or any other surfaces. This simply means it does not make a mess. Instead, it is easy to clean-up when your kids are done playing. It is mess-free which makes me happy because that gives them more time to play, and less time to spend on clean-up. 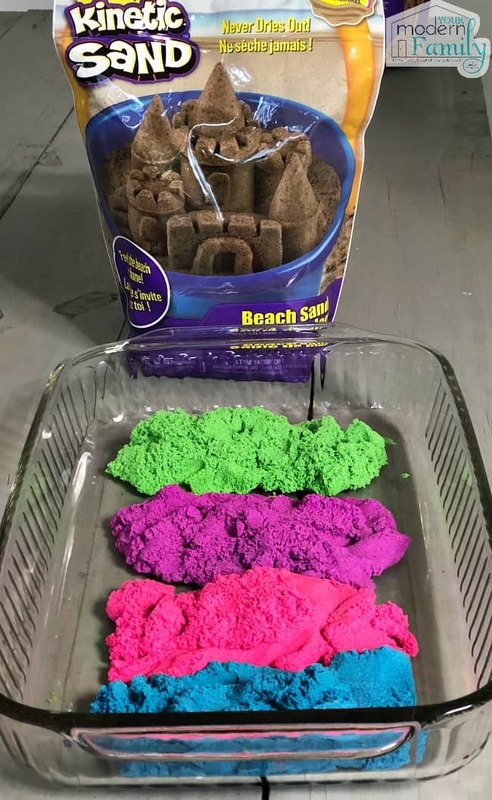 Spin Master’s Kinetic Sand comes in a lot of different colors (as seen in the image below). The kids loved the feeling of the neon colors below – just soft and silky-like. I loved that even though the neon sand was bright & colorful, it did not bleed onto our hands (or the table). The kids all kept their colors separate except for a small handful from each color. They combined all the colors to see what it would look like mashed together. I loved it as much as they did! Pros: 100% natural sand. Soft. 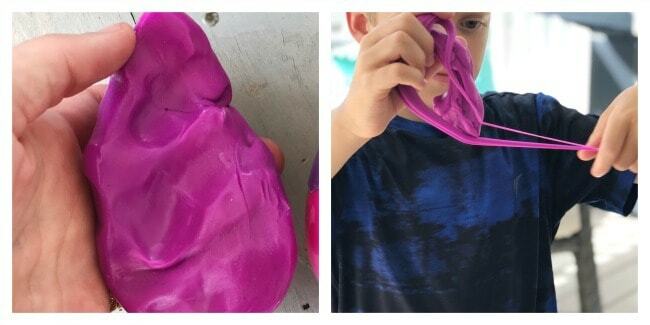 Easy to mold. Does not dry out. Holds shape, but can easily be changed and used again. Does not stick to hands. Cleans up very easily. Cons: Hard to pull kids away from playing. Overall: 10! This is the clear winner, without a doubt. From the playtime to the way it feels, to the cleanup, it’s the best of the group. 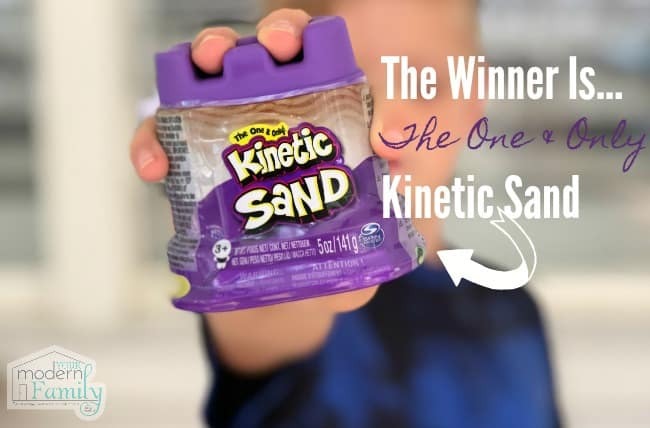 You can order your own Kinetic Sand here! In the meantime, check out their fun creations on their Facebook Page, Twitter, and Instagram.